Throw To Grow: Kickstarter Video. 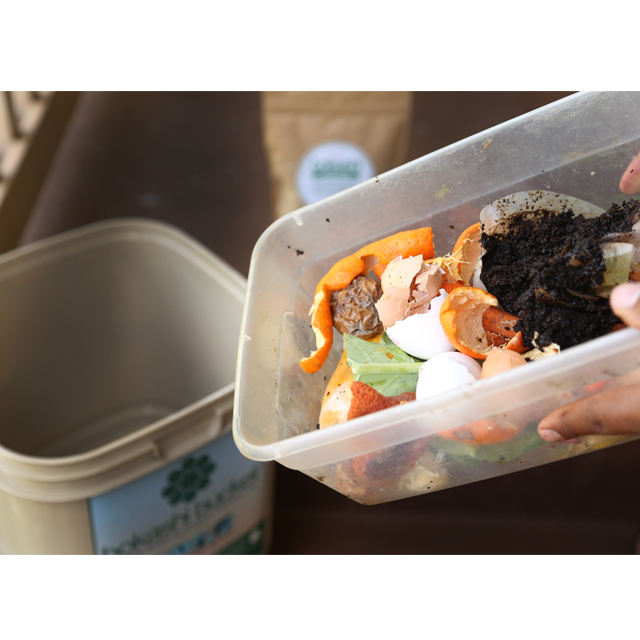 Food scraps–the stuff you scrape off your plate and into the trash after a good meal. The stuff you throw out because it went bad after two weeks in the fridge. The fruit that got spots on it as it sat on the counter waiting to be eaten. Not a big deal, right? WRONG. Food waste is actually mind-boggling, in size, scope and impact. This food waste problem is what actually got The Bokashi Bucket motivated to do something about it. Bottom line–food is an organic material that can be EASILY broken down to create enormously rich and nutritious humus for the soil. Food scraps are NOT waste–they’re a resource!! Here’s a little bit more background. The Bokashi Bucket is on Oahu, Hawaii. This wonderful state is made up of several islands (with people being on Hawaii Island, Maui, Molokai, Lanai, Oahu, and Kauai)–and no other land masses for thousands of miles around. Hawaii is literally the most isolated populated area on the face of the planet. That means everything we do here has an out-sized impact locally. That’s particularly true for food and trash. Most of the food we eat here has to get shipped here–which makes it crazy expensive. And whatever we “throw away” stays very close to us. Each island has its own landfill, and on an island, land is always at a premium. And yes, you guessed it–one of the biggest components to our waste stream here is food. The Bokashi Bucket wanted solve two problems with one solution–divert food out of the waste stream, and simultaneously use that to help farmers, gardeners and others have a ready source of wonderful composting material. – 25% of all fresh water consumption in the US is used towards producing food that is never eaten. – It takes 300 million barrels of oil every year to produce food that is never eaten. At The Bokashi Bucket we can’t stop food waste–we focus on turning a negative into a positive, turning trash into treasure. We give people an option to turn their food scraps in a resource to create new, healthy soil. So, come on an joint the Bokashi Revolution–because even Mother Earth needs a good meal too! GET YOUR BOKASHI BUCKET NOW!